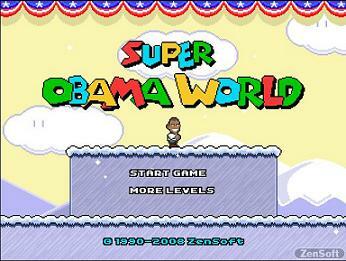 On my web travels today, I came across an Obama adaptation of Super Mario World – Super Obama World. Think Super Mario World but with political themes and real (by real I mean satirical) bad guys like robbers with loot bags, lipstick wearing pit bulls, farm yard pigs (I thought the lipstick went on the pig? ), lobbyists, Sarah Palin and delivery trucks (which I presume are carting around terrorists or immigrants? It’s not clear). So instead of doubling in size at the touch of a magic mushroom, Obama turns from (what I imagine to be) senator, into the President, with a slick MIB style suit to match. And instead of gathering coins, you demonstrate your patriotism and collect golden American flags. To top it off, each level ends with the inspiring Obama speech alteration – ‘Level completion we can all believe in’. The similarities between the two games are fantastic, right down to Obama throwing his hands in the air when he dies to the Obama World map with some interestingly named areas. President Obama in a Super Mario World remake, running around a virtual world modelled on the infamous Nintendo game is a great game not to mention a great way to waste time. Bravo to its creators. It’s free to play online and developers have promised further levels throughout Obama’s presidency. Check it out here. The trucks are carrying “Internet Tubes”. As Senator Ted said, “The Internet is not something that you just dump something on. It’s not a big truck. It’s, it’s a series of tubes,” So those are Internet Tube Trucks. Cracks me up.